This is a typical kakuro you will find on this site. First, look around the puzzle for a "series" that has only one possible combination of numbers. For example, this puzzle has a "3 in 2", which can only contains the numbers 1 and 2. We can use candidates to show these possibilities. Candidates can help greatly in visualizing a puzzle, and for seeing otherwise obscure deductions. We can also see that there is a "4 in 2", which can only contain the numbers 1 and 3. This will lead us to our first deduction. You will notice that now one of the cells only has a single 1 as the candidate. How can this be? Think of it like this: the numbers 1 and 2 must go in the "3 in 2". The 2 can't go in the bottom cell, since the "4 in 2" does not have the number 2 in it's sole combination of 1 and 3. Thus, the 1 must go there, and the 2 must go above it. We can now solve the last cell of the "4 in 2", which must be a 3. Looking above we can see another series that has only one possible combination of numbers, a "16 in 2", which can only contain 7 and 9. Now that we know the only two numbers that can be in the top cell of the "11 in 2", we can fill in the possible candidates for the bottom cell, which are 2 and 4. 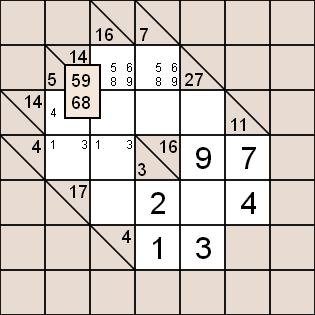 Any other number is not possible, for example a 5 in the bottom cell would lead to a 6 in the top cell, which is not one of the possiblities for "16 in 2". 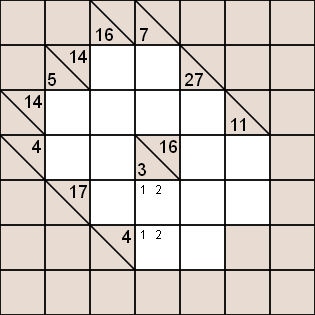 Since any series in a kakuro puzzle must not contain duplicate numbers, we can remove the candidate 2 in the bottom cell of "11 in 2", since there is already a 2 in the horizontal series. The cell can now only be 4. The remaining cell in "11 in 2" must be a 7. 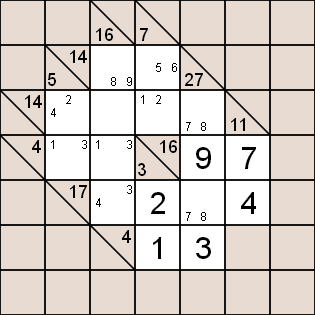 Once we solve that, the remaining cell in "16 in 2" must be a 9. We can perform a similar process to the opposite side, but this doesn't yield any solved cells immediately. We must look elsewhere. By clicking on the clue at the "14 in 2", we can see that there are 2 combinations of numbers that fit, 6 and 8, and 5 and 9. We can put these numbers in as candidates. We can remove some of the candidates on the right cell of the "14 in 2", since they don't fit in the "7 in 2". We can remove the 8 and 9. Now we can get rid of the corresponing candidates in the other cell, the 5 and 6. We can also add the only 2 candidates for the bottom cell in "7 in 2", a 1 and a 2. Again, this doesn't reveal any solvable cells, but it is good to have these candidates in place for later. Where do we go from here? We can look at the "16 in 4" and see that there are a bunch of combinations to deal with. It's a good idea to look somewhere where there may be fewer combinations before tackling this. Any deductions to be made here would be complicated. Looking at the "27 in 4", there are only 3 combinations, 3789, 4689, and 5679. We already have a 3 and a 9 solved in the series. That means the only possible combination is 3789. 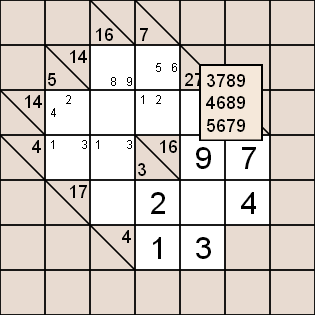 Since the only combination is 3789, and we already have 3 and 9, we can put the candidates 7 and 8 in the remaining two cells. The "17 in 4" series seems promising as we have already solved two numbers in it and have only two candidates in the rightmost unsolved cell. We could even think of this as something of an "11 in 2". The 4 and 2 are solved, bringing the total for the remaining two cells to 11. The only candidates that can go in the left cell are 3 and 4. 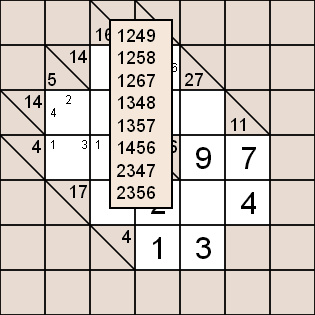 There is already a 4 in the series so the only possible number for the left unsolved cell is 3. 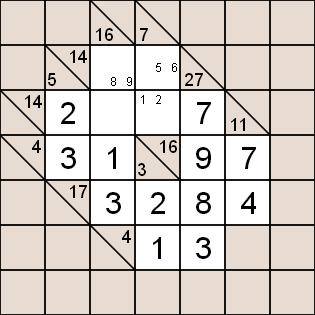 With that solved, there is only one unsolved cell in the series , which must be an 8. Now we have some easy deductions to make. The topmost cell in "27 in 4" must be a 7. The right cell in the "4 in 2" must be a 1. More easy deductions. The left cell in "4 and 2" must be a 3. 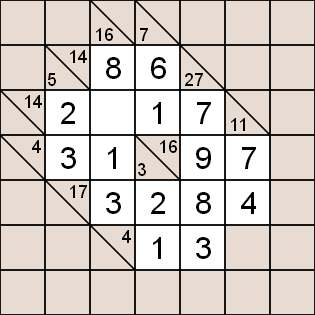 With that solved, the top cell in "5 in 2" must be a 2. This is where the early deductions at the top of the puzzle come in handy. We can blaze through the rest of the kakuro. The bottom cell in "7 in 2" must be a 1. Thus, the top cell must be a 6, and then the left cell in "14 in 2" must be an 8. For the last cell we can either manually count up the solved numbers in either of the series, or look at the possible combinations. 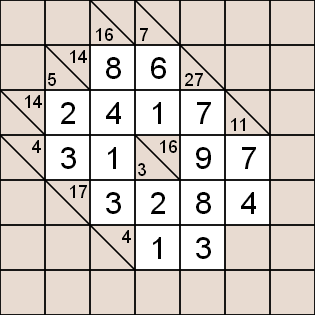 Either way, we end up with a 4, and with that solved the kakuro is complete. I encourage you to check out the generator and try a 7x7 easy puzzle for yourself. It may seem complicated, but once you've done it a few times many of the above deductions become second nature.